Making it through life, one craft project at a time. Week 2’s project isn’t a big one, but this technique is something I will refer to a lot in future posts. I am going to show you how I use a glazing technique to give something an old distressed look. Last week, I was cleaning up my craft closet and doing some reorganizing around the apartment, and I came across a small canvas that got messed up during my move. 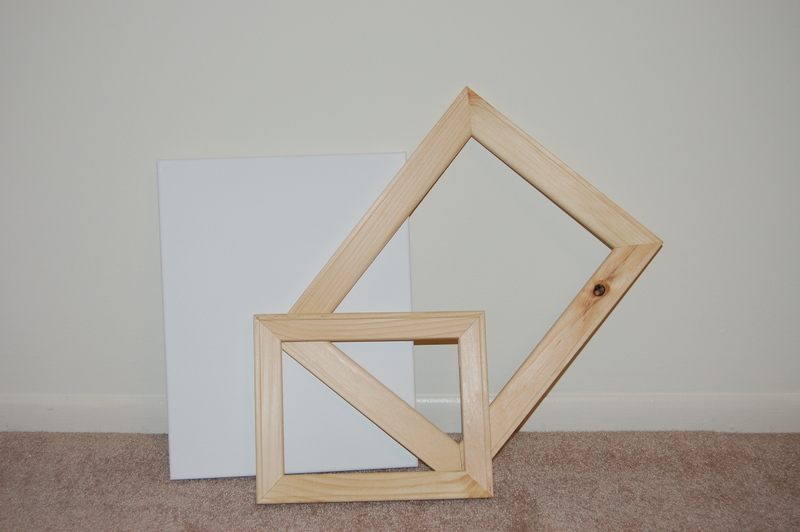 I was about to throw it away when I wondered what the wood frame around the canvas looked like. I got out my toolbox, grabbed a small flathead screwdriver and some pliers, and started prying out the staples that held the canvas to the frame. I was really surprised with how cute the frame actually is! I mean, who knew?! And this beats having to find a frame that you can paint at a thrift store or flea market. I’ll be explaining the glazing technique to the best of my ability, but I learned how to do it from another blog which shows a video of the glazing process for anyone who is interested. Sand down the frame slightly. This should only take about a couple of minutes. You don’t want to make it completely smooth but enough to get some of the paint off if it has been previously painted. 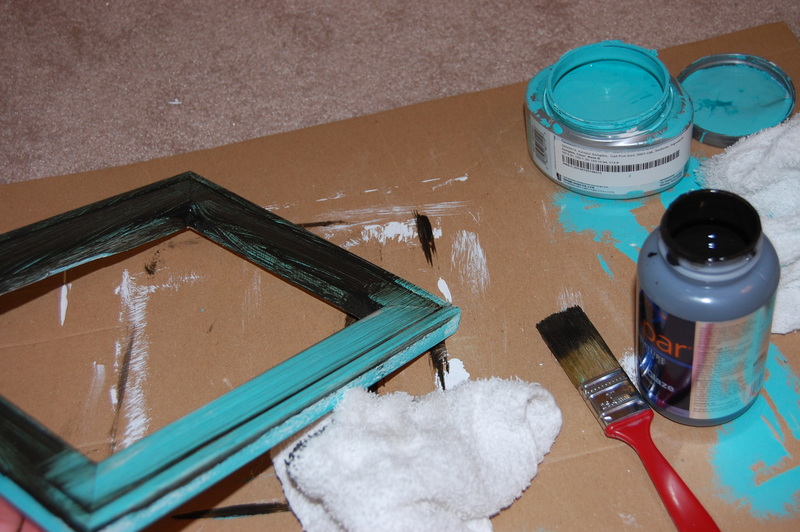 I painted my frame with white before using my color of choice (turquoise). 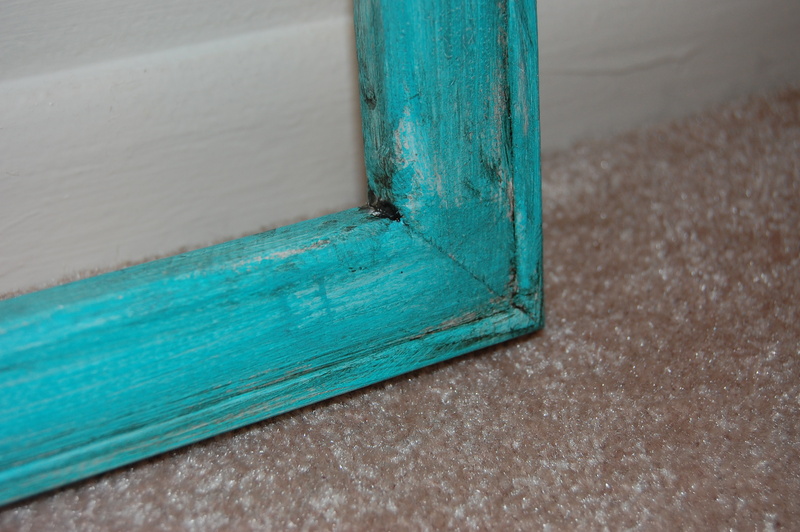 You definitely don’t have to do this, but if you are painting an old frame that already has paint on it, it might be good to paint it white first so the old color doesn’t show through. 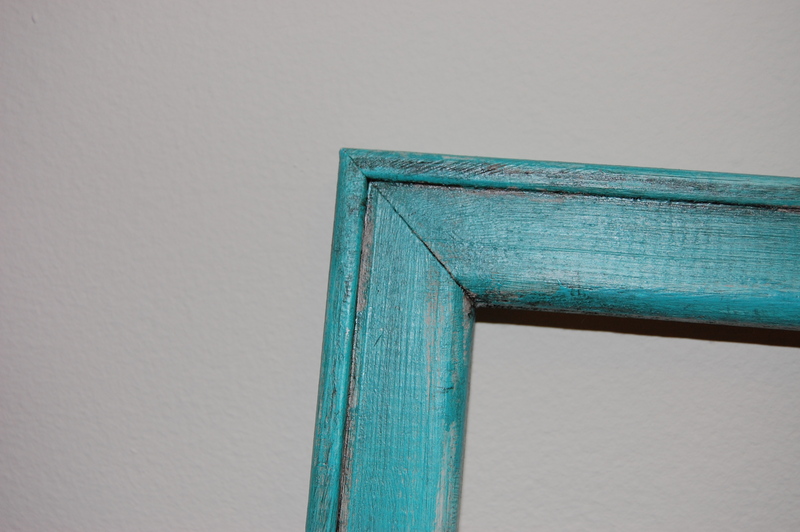 While my frame wasn’t painted before, I wanted to have a white base color on it so I could spot paint the frame with turquoise to give the frame a “shabby” look. When I say spot paint, I just mean that I didn’t cover the entire frame with the turquoise. I didn’t put a lot of paint on my brush to let some of the white show through the turquoise. Silly me forgot to take a picture of this step. Sorry y’all! 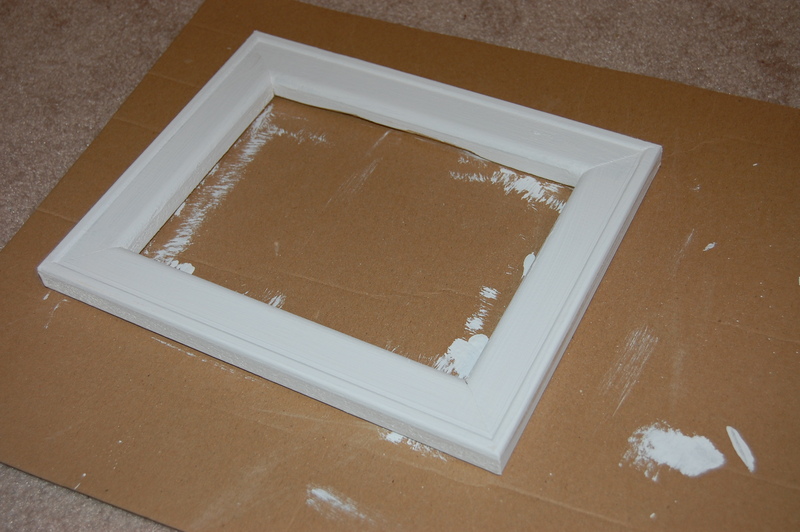 But here is a picture of the frame completely covered in white paint. 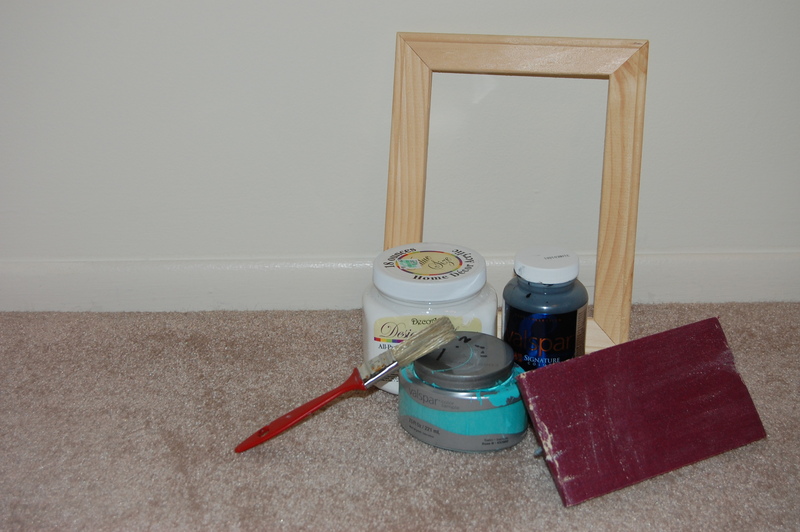 Once the paint on your frame is completely dry, it is time to paint on the glaze. You will want to make sure to get it in every little nook and cranny! Once you’ve painted on the glaze, you will use your old/unimportant washcloth to wipe off the glaze. You’ll notice that not all of the glaze will wipe off. You don’t want it to wipe it completely off. That’s how the frame will get it’s distressed look. In this picture, you can see what the frame looks like with the glaze painted on, and what it will look like when you wipe it off. Notice how some of it stays on the frame? That’s perfect. The glaze will stay in all of the nooks and crannies which is why you don’t want to sand it completely smooth in the beginning, but just enough to calm down any really rough parts. And there you go! 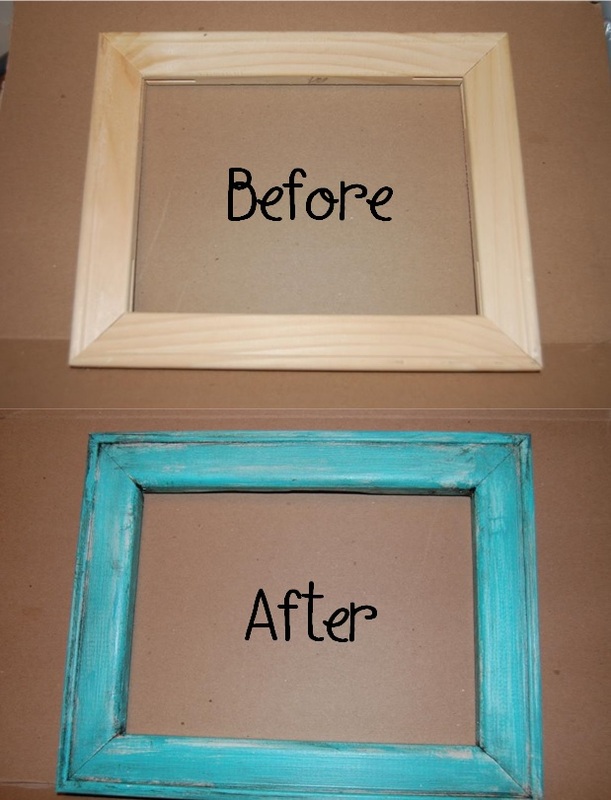 Now your frame has an old/worn antique-y look!